In recent years the sales of disposable wet wipes for adults, have skyrocketed. Big box stores like Target and Sams Club have entire sections dedicated to them in the toilet paper aisles. To be completely honest, it makes sense. Wet wipes have an advantage in leaving one feeling more clean after using the restroom when compared to standard issue toilet paper. So, it comes as no surprise that they’ve soared in popularity in the last few years. The issue with these disposable wipes is one word that consistently appears on their packaging, “flushable.” This is mislabeling at best and dishonest and misleading at worst. I mean, sure, if you attempt to flush them down your toilet they will in fact flush. I can think of a long list of items that can also be flushed down a toilet however, that doesn’t technically make them flushable. 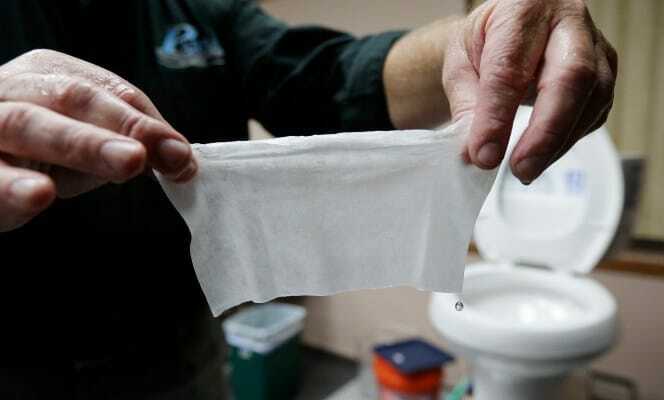 There are no shortage of horror stories online about massive clogs in drain pipes and home septic systems caused by the use of flushable wipes. You might be thinking to yourself, ok but drains that never see flushable wet wipes also get clogged so whats the deal? Below I have outlined some of the main reasons wet wipes are a catalyst for clogs and why you should stop using them in your home & businesses immediately. I’ll begin by reiterating what we already know. Wet wipes made by large companies like Charmin and Cottonelle are disposable & can be flushed but that does not mean that they should be. Unlike toilet paper that breaks down quickly when wet, disposable wet wipes take an extended period of time to do the same. This means that over time they accumulate and can clog the pipes in your home leading to catastrophic plumbing issues. Essentially, it comes down to understanding that disposable means that they should be disposed of in a trash can, not down your toilet. Another large issue with the cloth-like material used to create these disposable wipes is that they are non-woven. Instead, they are a combination of natural and synthetic fibers like cotton, rayon, and a mixture of plastic resins. They are engineered this way so that they can be both strong and thin as well as maintain their strength while wet. If you were to pull a list of all of the materials used to make these wet wipe products, you’d see that most of the materials on that list are the same materials you’d find used in the creation of plastic bottles & bags. We all know that plastic is not biodegradeable and that it takes a very long time to even begin disintegrating. Now compare that to toilet paper. Tear off a few squares and run it under a faucet. What do you notice? It’s likely the toilet paper began disintegrating as soon as it came into contact with the water. Try that with a wet wipe and you can stand there for days and nothing will happen. The final major issue we’ll discuss comes from the fact that when objects sit in your homes drains and sewer line, they are like a magnet for other materials traveling down the line. This is the most important but often the most overlooked issue with these products. While drain pipes vary in size from area to area and state to state, a common size throughout the State of Texas is 3.5-4 inches in thickness. Since they are not biodegradabled but are still porous, water will pass through them but solid materials such as human waste, food waste, hair, soap scum, and grease will get trapped right along with the wipes. This creates blockages in the pipe and can lead to catastrophic plumbing issues like sewage back-ups into showers, sinks, and tubs. They can even lead to breaks or ruptures in a homes sewer line! If a clogged drain backs up into your home you will be dealing with one of the most unpleasant possible plumbing situations you can experience. If you are experiencing clogged drains in your home and are in need of clogged drain cleaning in Dallas, Mesquite, or any of the Surrounding Areas, give Flow Plumbing a call today! We are standing by ready to clear even the most stubborn clogs!